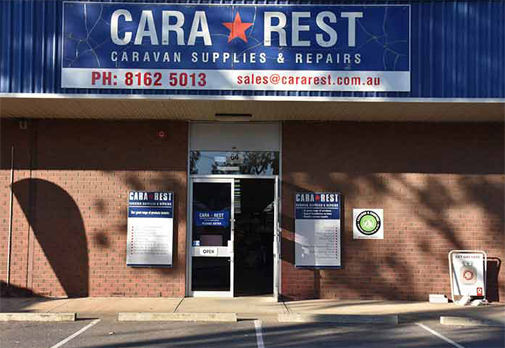 Cara Rest Supplies and Repairs has the largest caravan showroom in South Australia and offers a one-stop-shop for all types of caravan products and services. We have a well-equipped workshop and our skilled staff are able to do repairs and installations of all sizes. We offer a comprehensive range of products and services including accessories, parts, spares, repairs, installations, trip preparing and servicing. From getting you ready for an adventure to creating your dream home-away-from-home, we’d be more than happy to help. We will aim to keep the time you’re off the road to a minimum. We are able to do all sorts of repairs from re-glazing windows to major accident work. We are an approved repairer for all insurance agencies and are able to carry out insurance work for you. We are able to customise your caravan to suit your needs, from installing a new fridge or awning to modifying your caravan to increase storage space or to change the size of a bed or table. Whatever you are looking for, we are agents for a large range of suppliers and if we don’t have a product in stock, our friendly team will aim to source it for you. Our family business has a skilled team who would be happy to share their knowledge with you. Visit our showroom in Kilburn to create your dream home-from-home.